With its hundreds of canals, waterways and narrow channels that divide the city like an intricate web, you never feel stressed, pressed or on edge, as is often the case in the core of large cities filled with cars, trucks, busses, trollies and other forms of wheeled transport. It is amazing how a city can be transformed when you take away that traditional traffic. Even when Venice is filled to capacity with people, as it was during part of our visit, you can still find elbow room, space to relax, fresh air and a quiet spot on a sidewalk cafe overlooking the water. No wonder it is a major port of call for the dozens of cruise ships that criss-cross the Adriatic, Mediterranean and Agean Seas. Even though Lynn and I arrived by train from France after meandering across Germany, Switzerland and Northern Italy, it is just as easy to head directly to Venice if your interests lay in the more southerly ports of call. Ports within range of a 7, 14, or 21 day cruise from Venice, include a mix and match of the following popular destinations: Loper, Slovenia; Dubrovnik and Split, Croatia; Corfu, Katakolon, Athens, Mykonos, Rodes and Santorini, Greece; Kusadas, Turkey; Bari, Florence, Naples and Rome, Italy; Haifa and Jerusalem, Israel; Alexandria, Egypt; Barcelona, Spain; Nice, France, to name but a few. Photo (left): Cruise Ship enters Venice in the late evening of a holiday week-end. Both ships in these photos nearly touch the Piazza del Marco as they pass quietly by. You may even consider a river cruise which has become increasingly popular in recent years. 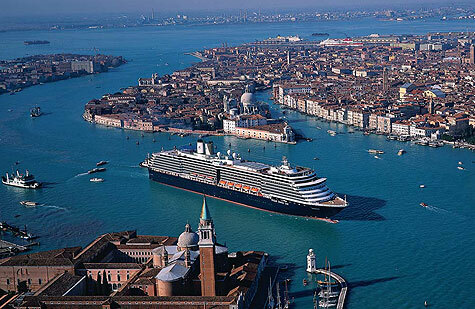 In 2013, Uniworld is planning their inaugural Venice intinerary as well as other excursions that will enhance your travel experience. Whatever may be your interest, give Lynn or your current travel professional, a call and you will be provided with expert help in planning your next trip. Whether you are an experienced traveler, or a ‘first timer’ planning the trip of your dreams, a travel professional can help you find the very best value within a price range that meet your needs. The consultants also have access to packages that provide additional value not available through on-line, advertised specials. Lynn is an independent Travel Consultant with the Expedia CruiseShipCenters, working from home or or the Bevan Street office in Sidney, British Columbia. 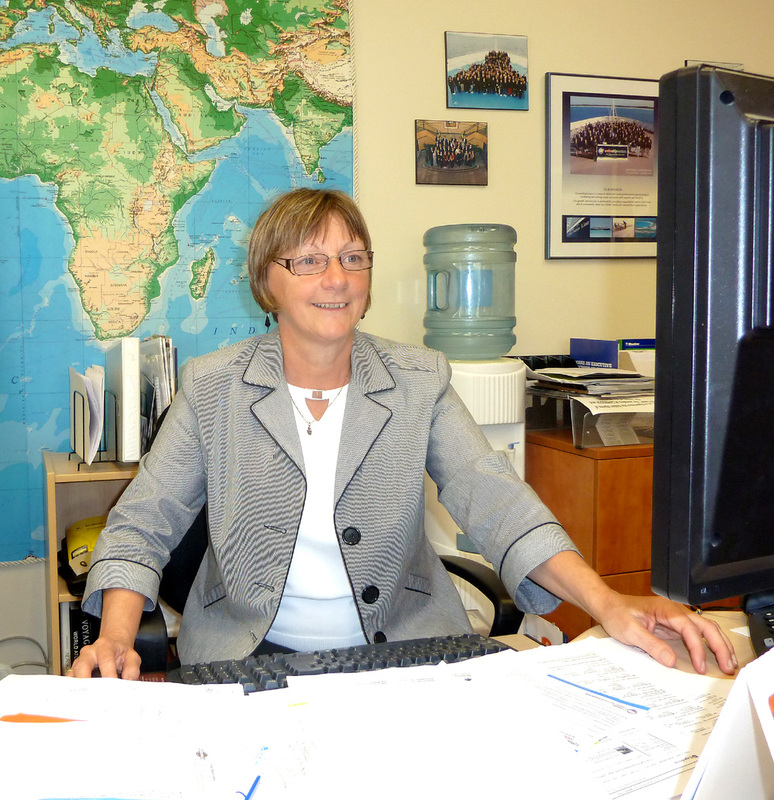 At one of the leading travel offices on Vancouver Island, Lynn continues to expand her knowledge of the travel industry and everyone who knows her, will agree that she always gives 100% to the task at hand and, for those who don’t know her, that fact will soon become apparent. Being posted in early April 2012, will be a series about a river cruise along the Blue Danube as Lynn and Harold spend two weeks with friends Garth and Esther Dunn as we travel to Budapest, Hungary, then through Austria and Germany on a Uniworld Cruise. This will be followed by a land extension tour to Prague, Czechoslovakia. For the four of us, this will be our first river cruise. centre top of this photo. areas mentioned in this post.